Cosmobot has made speech therapy fun for Kevin Fitzgerald, 6. He has developmental dyspraxia, a condition which makes it difficult for him to move his mouth and tongue. Industrial robots weld car parts together, assemble components for computers and move large containers of hazardous materials. Now researchers are taking the field of robotics one step further, by creating "socially assistive" robots that can provide personalized, interactive therapy to children with special needs. Kevin Fitzgerald has made impressive gains since working with his special robot. When you first meet Kevin Fitzgerald, he looks and acts like a typical six-year old. He's lively and engaging and likes to play with computers. But one thing that sets Kevin apart from his peers is that he doesn't speak. That's because Kevin has a severe case of developmental dyspraxia, a condition which makes it difficult for him to move his mouth and tongue. Like many children with speech difficulties, Kevin works with a specially trained therapist to develop his speech. Cosmobot's creator, Dr. Corinna Lathan, says children can relate to as well as control, talk to and become friends with the interactive robot. But Kevin's therapy goes beyond standard treatment. It includes working with a robot. 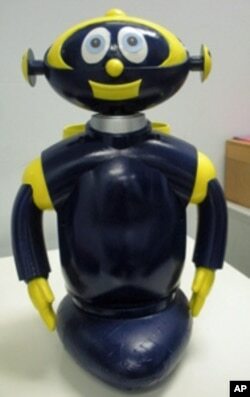 Cosmobot, as it's called, looks like a mechanical doll, with moveable arms and legs. It is blue, about half a meter high, and has big eyes and a smiling mouth; facial features that kids find endearing. Carole Samango-Sprouse is a certified neurodevelopmentalist who has been working with disabled children since 1982. She says what impressed her about Cosmobot was that it engaged kids immediately. "They were absolutely entranced. They would work harder and longer. And we saw it on the first day, first child. And every child was like that," she says. One of the reasons Cosmobot is such a successful therapy tool, says Samango-Sprouse, is that children within Kevin's age group [between three and eight] think of it as a live person. They talk through the robot, and use it to follow directions. Carole Samango-Sprouse with Kevin Fitzgerald. Her goal, as a neurodevelopmentalist, is for all of her patients to reach their optimum potential and, ideally, be independent of their parents. 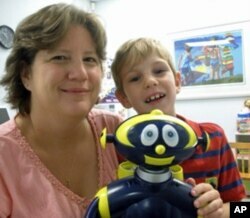 During therapy with the robot says Samango-Sprouse, kids will work harder and for a longer time period. "They will stay with you as long as you're willing to work," she says. Samango-Sprouse has been treating Kevin for two years. During a recent therapy session, Kevin cradled Cosmobot in his lap and used its moveable arm to point to words on a chart. While pointing to words is not fun for Kevin, says Samango-Sprouse, the fact that he could use the robot to point to the words, "made it fun." In addition to using the robot to talk and follow directions, Kevin also likes to control its movements. By using a set of buttons that are attached to a computer, Kevin can make Cosmobot go forward, backward or move around in circles. Samango-Sprouse says Cosmobot gives Kevin a sense of control. By using him as a compliant partner, she says, Kevin concentrates harder and follows directions better, which makes his therapy more effective. "Cosmos gives Kevin planning capacity; he gives him independence because he can select with Cosmobot what he wants to do, and he gives me a vehicle to say, 'this is really hard, Cosmos really wants you to do it, let's do it together.' And he will work harder for it," she says. Kevin's mother, Patti Fitzgerald, says Cosmobot has made a positive impact on her son's social life. Kevin's mother, Patti Fitzgerald, says her son has made great progress since he began working with Cosmo. "When he's playing with his friends he's a little bit gentler," she says. "He used to walk up and hit somebody on the arm to say hello. I don't see him doing that any more. He's more [likely] to wave, and I think some of that comes from Cosmo just being quiet and Cosmo's very simple and Cosmo is steady and calm." The mastermind behind Cosmobot is Dr. Corinna Lathan. 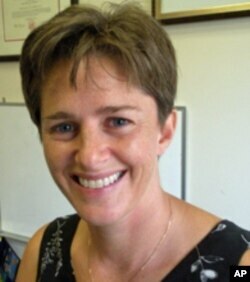 She is the founder of AnthroTronix, an engineering research and development firm that she founded 10 years ago. Lathan says she started the company to help children with cerebral palsy, Down's syndrome, autism and other types of developmental disabilities. The inspiration, she says, "was that the children's needs were not being met as well as they could have given the technology advances that we've seen over the years." Lathan says children seem to respond to Cosmobot physically, socially and cognitively. "They become friends with Cosmobot; Cosmobot is able to elicit behaviors that had been either considered very difficult to elicit or non-existent in children. Cosmobot has a tremendous impact on these kids within the therapy session." While there are still many challenges ahead for Kevin Fitzgerald, his mother Patti is cautiously optimistic. She says she would love to see him get married, have kids and get his college degree. "I'm not sure if that is possible, but we'll have to wait and see," she says. His therapist, Dr. Samano-Sprouse, is also encouraged. She expects that Kevin will be speaking by age 10, and will be conversational and understandable, though his speech, "will probably never sound normal," she says. She anticipates Kevin going on to college, "in a very supportive, selective setting," but cautions that there's still a lot of work that needs be done to get him there. Socially assistive robots like Cosmobot are still considered research tools, Corinna Lathan says, and are not used as much in the United States as they are in other countries. But she is optimistic that that will change, and Cosmobot will eventually be more accessible to children like Kevin.